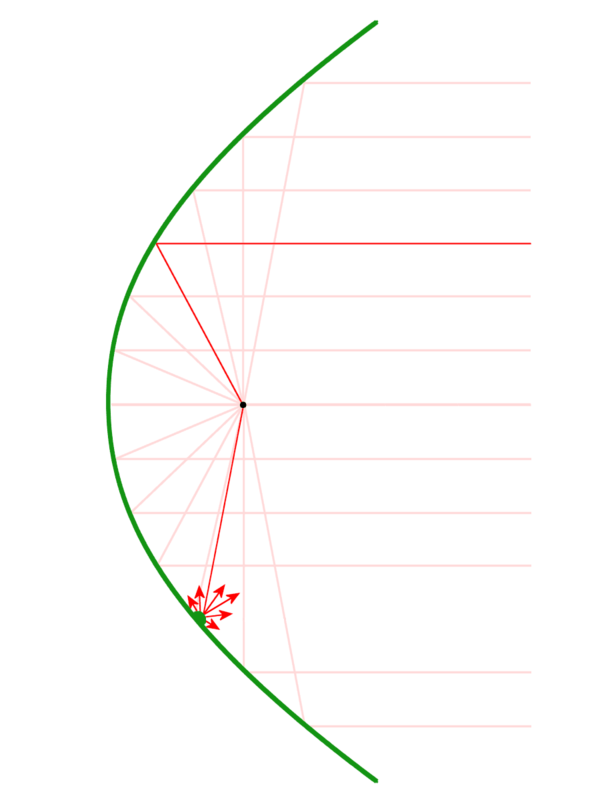 Sidelobes are partly due to the fact that a perfectly shaped paraboloid cannot be achieved. We can only obtain an approximated shape with a certain tolerance. This tolerance value is equal to λ /32 if we want an acceptable level for the sidelobes. If this tolerance is not achieved, diffuse reflections (instead of specular reflections) leading to an increase in sidelobe levels. This tolerance results in variations in antenna performance between samples. It is therefore prudent to obtain polar diagram characteristics for each antenna of the same type. The production of a perfectly squintless antenna requires a specialised measuring enviroment, as shown in Figure 2. Furthermore, in service damage to the reflector must be rectified to the appropriate tolerances. Accumulations of ice can generate irregularities on the reflector surface and degrade antenna performance.